Diet is THE most critical component to a healthy lifestyle. It also happens to be an area that many people struggle with. This section will teach you how to eat to kick on your biochemical machinery and bring you to the physiologic make-up that your body deserves. For men it’s around 11-12 percent body fat and for women it’s about 18-20 percent body fat. You can expect to see changes within the first week by implementing this diet and you will continue to shed weight effortlessly for weeks to come. Eat when you are hungry and until you feel satisfied. There is no need to count calories or weigh your food. Focus on eating real whole foods with single ingredients. Avoid food with more than 3 ingredients on the label! You should practice the ‘eye-ball’ test. That is, look at food with your eye’s and you should easily be able to determine if the food is real or if it was processed in a factory (examples: boxed potatoes versus real potatoes – very easy!). This will halt your weight loss in its tracks. Especially avoid soft drinks/soda, candy, juice (apple juice, orange juice, etc. ), sports drinks (gatorade, powerade, etc. ), chocolate, cakes, pastries, ice cream, breakfast cereals, artificial sweeteners. Bread, pasta, rice, potatoes, french fries, potato chips, porridge, oatmeal, etc. Whole grain or whole wheat products are still bad! Avoid legumes (beans and lentils) in the beginning, though you may be able to add these and root vegetables back in moderation (potatoes, sweet potatoes) when you achieve your goal weight. Incredibly unhealthy and pro inflammatory in high doses, very high in omega 6 fatty acids. Think of this as liquid bread – lots of rapidly absorbed carbohydrates that lead to insulin resistance. 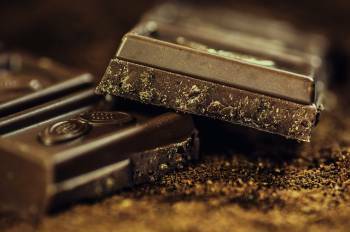 Dark chocolate: Always at least 70% cocoa and limit serving to 1-2 ounces. The darker the chocolate the more health benefits. Blackberries, blueberries, cranberries, kiwi, lemons, raspberries. These fruits are jam-packed with antioxidants and have significantly less sugar per serving than other fruit. Note that some people are very sensitive to fructose in fruit, monitor your fruit intake carefully and eat as a treat. Water: Aim for 1 gallon per day, minimum of 64 ounces/day. Tea: All kinds of teas with caffeine or without are great for health. 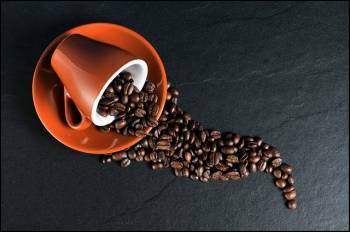 If cutting back on coffee try yerba mate, green tea, or black tea.Coffee: 3-5 cups per day, consume with full fat products (heavy cream, full fat coconut milk). Try bulletproof coffee with grass fed butter, coconut/MCT oil, and liquid stevia. How does eating low carbohydrate, high fat work for weight loss? Diets high in refined carbohydrates (breads, pastas, oats, grains, etc.) and sugars cause increases in the hormone insulin (refer to the interplay of hormones and obesity). Unfortunately any trace of insulin – even one slice of bread worth, will completely shut down fat burning as a source of fuel in your body. 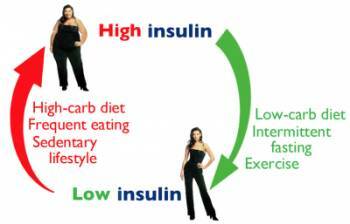 When you have sustained levels of insulin, otherwise known as insulin resistance, your body never gets the chance to burn fat for fuel. Instead it is reliant upon sugar and glucose as its primary energy source. 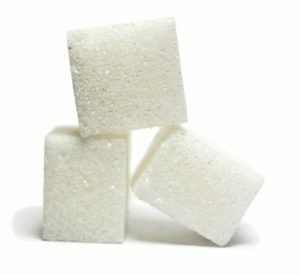 Your entire body can only hold about 2,000 calories in the form of sugar or glucose. Compare that to fat which even an average person carries close to 100,000 calories! The cruel joke is that when eating diets high in carbohydrates your biochemistry doesn’t allow your body to use any of those fat calories and instead it is reliant upon sugar and glucose. This reliance on sugar combined with the relatively low supply of calories in your body stored as sugar, cause massive swings in blood sugar throughout the day. These changes in blood sugar cause irritability, fatigue, lethargy and a constant need for snacking and eating. Foods high in healthy fat do not cause an increase in insulin and thus lead to a very constant and controlled blood sugar. It also changes your biochemistry and ‘unlocks’ the fat stores in your body as a source of energy. When following the high fat, low carbohydrate diet there are some potential pitfalls that can really curb your weight loss. One of those is not eating enough fat. The other is eating too much protein in its place. Many people think that following a low carbohydrate diet means you just eat meat all day without any bread. While meat is fine, you can’t forget the healthy fats! Eating this much fat can sometimes make people nervous. They think that eating fat will cause them to get fat. Eating too many carbohydrates makes you fat because of the insulin. Insulin turns glucose and sugar straight into fat. Several studies show that eating fat causes you to lose weight. (2) These studies also show that high fat diets are superior to low fat, calorie restricted diet both in the amount of weight loss and in how the weight loss changes other risk factors for heart disease and diabetes. The best part is this: you don’t have to restrict the amount you eat to lose weight either. Once you change your biochemistry and your internal thermostat your body burns fat as a fuel and weight loss becomes effortless. How do you add more fat to your diet? Start cooking with fats (coconut oil, olive oil, grass fed butter). Add it to your recipes in place of things like canola oil. Coat your pans with healthy fats and then add it on top of your food after you’re done! There are plenty of high fat sauces that taste amazing that go on top of vegetables, steak, chicken, etc. Start making your own salad dressings. Add nuts to your diet. 1-2 tablespoons of nut butter per day or a handful of healthy nuts. Eat high fat dairy products. Make whipping cream out of heavy cream and add it to blueberries or strawberries. Drink whole milk. Add fish to your menu 2-3x per week. Add avocados and olives to your dishes. Look on google for more high fat low carbohydrate recipes. Are all carbohydrates bad for me? Carbohydrates from all sources are NOT created equal. When I refer to carbohydrates and sugar these terms are often used interchangeably when they really are two different animals. Carbohydrates are broken down into sugars after they are consumed, and so most people don’t differentiate between the two for this reason. The take-away point here is that certain carbohydrates (made up of many sugar molecules) are broken down into sugar at slower or faster RATES depending on several factors. When you slow down the rate at which they are broken down you slow down the rate that they are absorbed. 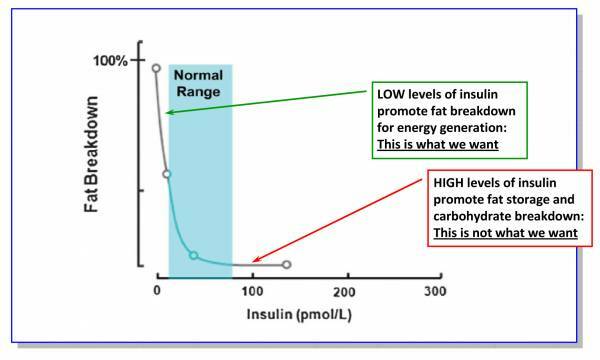 This is important because the absorption rate is what determines the amount of insulin that is released. So, the question really is this – what carbohydrates are slowly absorbed? The answer is natural whole foods that are high in fiber. Think of vegetables, fruit, potatoes, sweet potatoes, carrots and beans of all kinds. When you consume natural whole foods that are both high in fiber and high in carbohydrates (like those listed above), you slowly absorb them and do not spike your insulin levels and do not trigger the negative cascade of events that is caused by other high carbohydrate/low fiber foods (bread, cereals, pasta, rice, soda, etc.). A word of caution: It is best to stay away from starchy foods while you are trying to lose weight. If you are overweight to begin with then we know you already have some degree of insulin resistance. For this reason it’s best to reintroduce starchy foods AFTER you have sensitized your body to insulin with a low carbohydrate diet in conjunction with intermittent fasting. Don’t reintroduce healthy carbohydrates into your diet until you are at your goal weight. Will I be hungry without carbs? If you are like most people you are probably living in a state where it’s difficult to think about going 12 hours without food. This constant sensation of hunger is triggered by low blood sugar but also because your brain isn’t getting the right signals – when you’re hungry or when it’s time to stop eating. Much like your body gets resistant to insulin, so to does it get resistant to leptin. Imagine a scenario where you are given the option between unlimited blueberry pancakes or unlimited pork chops. You always seem to have room for 1 more pancake, even though you are stuffed to the brim. This isn’t true with the pork chops though. Once you have a couple the thought of another almost makes you sick. The reason for this feeling is the fat content of the food. Your body actually prefers to burn fat when it can. Fat is a more metabolic efficient molecule than glucose is in terms of what your body can do with it. Fat on a per molecule basis turns into much more energy than glucose. This is why counting calories and weighing food don’t matter anymore. You simply eat until you feel full and satisfied and let your body do the rest. On a high fat diet you will enjoy controlled blood sugar levels and a more sustained feeling of energy. You won’t find yourself slowing down in the mid afternoon looking for a sugary beverage with caffeine to kick you into gear. Your blood sugar and energy levels stay constant and consistent. When you understand the biology of obesity and metabolism you can more easily “hack” into your body’s chemistry to get long lasting amazing results. This diet is very doable because you literally get to eat highly palatable, nutritious foods. What about my cholesterol and lipid profile? If you eat more fat, especially saturated fat and cholesterol, wouldn’t that increase your blood lipid levels and put you at increased risk for a heart attack? This couldn’t be farther from the truth. This mindset, and way of thinking represents the last 40 years of fat fear that was based on little evidence. Research dating back many years ago, and even current research show that eating low carbohydrate high fat will actually improve your lipid profile and reduce your risk of heart attack. Not only this, but you will find your blood pressure improve, your blood sugar levels drop and your HDL (the good cholesterol) will also increase. Will I experience side effects in the beginning? When you stop eating sugar and refined carbohydrates you may experience some side effects as your body adapts to burning fat instead of sugar for fuel. These side effects have been referred to as the “low carb flu”. Despite this name, they tend to be quite mild and even then they can be decreased with some easy interventions. These side effects only last about 3-5 days and can be decreased by drinking plenty of fluid and taking in plenty of minerals. Predominately you want to increase your salt intake by taking salt tabs, and by drinking 1-2 cups of broth per day or adding extra salt to your meals. Insulin acts on the kidneys to cause water and mineral retention. When you reduce insulin and carbohydrates your kidneys tend to “spill” out more of these minerals. It doesn’t take long for your body to figure out what’s going on, though, and make changes. You can also try getting a prescription medication for an appetite suppressant from your doctor to help you get through this time period if you are having trouble. Phentermine works well for this. Low carbohydrate diets can vary in range from < 10 grams per day total to < 100 grams per day. In the beginning I recommend eating enough carbohydrates to allow inclusion of vegetables and fruit (on occasion). In general, the lower your carbohydrate intake the faster you will lose weight. In the beginning of your journey it is therefore better to reduce carbohydrates to the range of 50-75 grams per day which is made up of real whole foods and primarily vegetables and fruits. Maintaining a low carbohydrate diet that induces ketosis (typically carbohydrate programs < 10 grams per day) can be beneficial for certain health conditions including: alzheimer’s, multiple sclerosis, epilepsy, cancer and parkinson’s. This type of program works by inducing the production of ketone bodies that act as a completely different energy source in the brain. I don’t necessarily recommend this diet for everyone unless you have a medical condition where it would be helpful. That doesn’t necessarily mean you should be afraid of ketosis, in fact this is something that you should aim for on your fasting days, but it doesn’t mean you have to be in it 24/7. How long can I be on this diet? You can stay on this diet indefinitely with some minor tweaks over time. Once your weight loss has been achieved you can slowly add in healthy starches in the form of whole foods like red and wild rice, potatoes, sweet potatoes and beans. What about my other health problems? As a bonus you will likely find that many other health problems you have will improve or completely resolve. Think of food as information. Information both for your gut bacteria and for your genes. When you cut out the bad information (sugar, grains, etc.) your body starts to turn on genes that protect you from chronic health problems such as diabetes, hypertension, hyperlipidemia and cancer. In addition this diet will also promote changes in your gut bacteria to support healthy bacteria that regulate your immune system and hormonal balance. 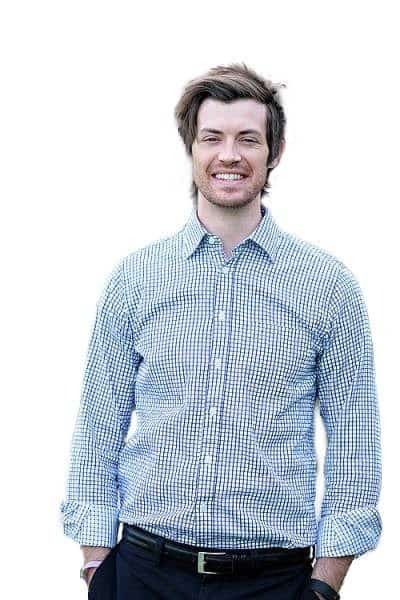 It’s not a coincidence that I include lifestyle changes into this program (stress reduction, sleep patterns, and hormonal testing), because everything in the body is so well connected. Now it’s your turn… do you have experience eating a low carbohydrate high fat diet? What kinds of results did you get? (1) Gardner, Christopher D et al. “Comparison of the Atkins, Zone, Ornish, and LEARN diets for change in weight and related risk factors among overweight premenopausal women: the A TO Z Weight Loss Study: a randomized trial.” Jama 297.9 (2007): 969-977. (2) Volek, Jeff et al. “Comparison of energy-restricted very low-carbohydrate and low-fat diets on weight loss and body composition in overweight men and women.” Nutr Metab (Lond) 1.1 (2004): 13. (3) Nazarians-Armavil, Anaies, Jonathan A Menchella, and Denise D Belsham. “Cellular insulin resistance disrupts leptin-mediated control of neuronal signaling and transcription.” Molecular Endocrinology 27.6 (2013): 990-1003.